Many good things are happening in China. Businesses are prospering. Living standards rise. The country’s interior is still quite poor but life is improving. 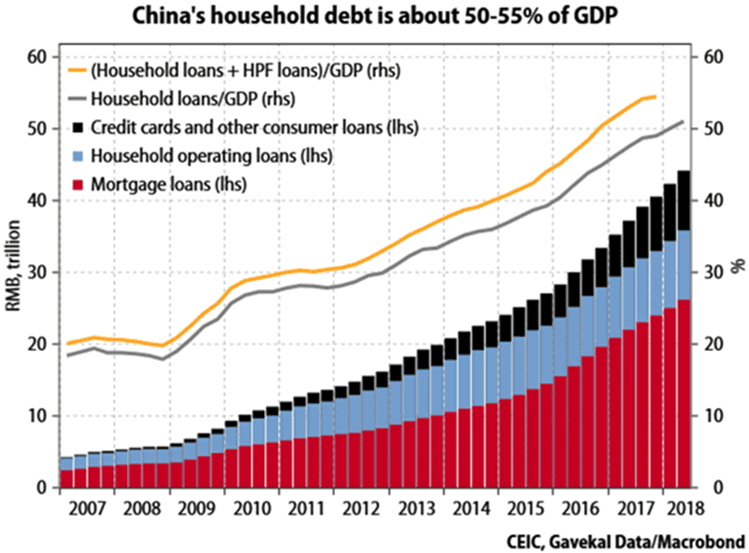 You often hear about China’s government and corporate debt, but less about households. Back in 2015, I wrote about China’s insanely leveraged farmers and others who bought stocks with borrowed money… most regretted it. That period seemed to convince the government to keep tighter control over consumer credit. But note, controlling credit isn’t the same as reducing credit. Let alone eliminating it. Beijing wants consumers to borrow in productive, sustainable ways. This is why overall household debt growth has not slowed. In fact, the chart below shows that Chinese consumer debt is growing quite a bit faster than Chinese GDP. This means that consumer debt is a growing percentage of the economy. It’s not a big problem now, but at this rate, it will become one soon. 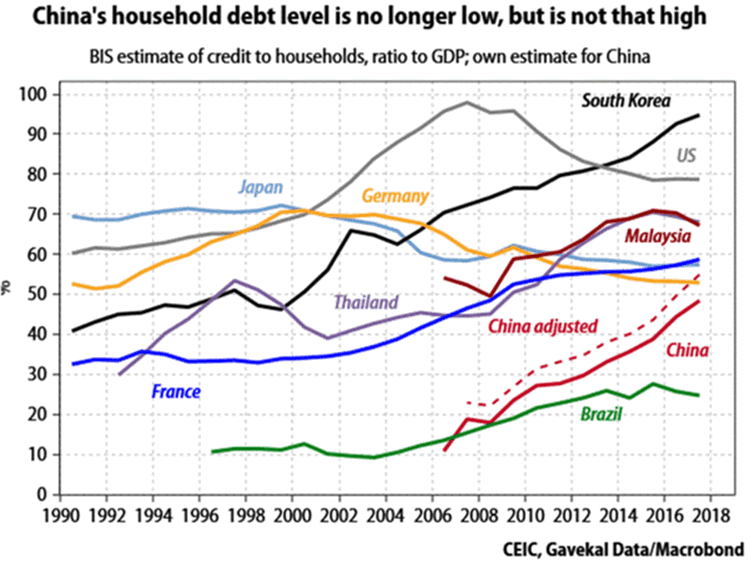 The next chart shows how Chinese household debt is growing compared to other economies. Household debt relative to GDP is near-flat or declining in the US, Japan, Germany, and France. 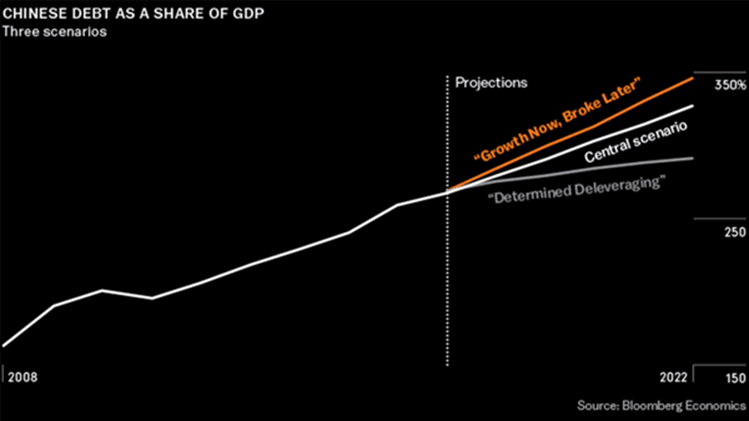 In China, it’s grown from 40% to 50% of GDP in just two years. Yes, those developed countries have higher absolute debt levels, but they also have higher household incomes. So this trend, if it continues, will get more worrisome. China’s debt is hard to visualize. There’s a lot of it. Here is a chart that projects three scenarios out to 2022. Below is a look at private sector credit creation from Citi Research. The US series is only bank credit, so this isn’t an apples-to-apples comparison. But then much of Chinese debt is bank credit. The “shadow banks” are relatively new. Xi seems to be trying to reduce their influence. 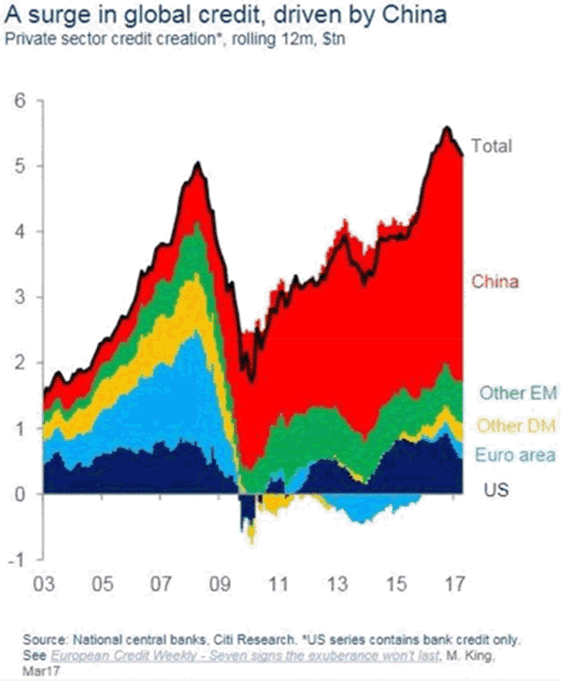 But however you look at it, China has huge private debt. Finally, here’s a “Total Credit to Private Non-Financial Sector” chart. That means it excludes bank debt. The US has the most such debt at $29.5T as of year-end 2017. But China is not that far behind with $26.5T. China’s debt of this type was quite a bit more than Japan, the UK, and Canada combined. Chinese growth has been largely funded by debt. Loans have fueled almost everything. That debt will eventually have to be repaid. And debt is future consumption brought forward. That means at some point Chinese growth is going to slow down. Maybe not for a decade or so, but they have to pay the piper. Not only that, China has off-the-books debt that may not show up in the totals. Any way you look at it, China has a staggering amount of debt. Maintaining it will grow more difficult if the economy turns down. Now, what happens if living costs rise due to a trade war with the US? One possibility is “not much.” The Chinese don’t really need our goods. They have plenty of domestic alternatives in most categories. Still, a trade war could raise prices in some categories. But the bigger problem is that a trade war will mean lower exports. This will probably affect the jobs of some indebted consumers. How many is unclear. China has both domestic demand and other countries it can trade with. Domestic demand might weaken if exporters reduce employment and the government doesn’t step in with some kind of stimulus. The problem here is that any stimulus would probably increase government debt, a problem we haven’t even discussed yet. Not to mention corporate debt rising as companies try to keep operating with lower revenue. All of this is true for the US, of course. Which country is better equipped to survive a trade and currency conflict?